While most of the animation world is clamoring for Andreas Deja’s new book, The Nine Old Men, I have been waiting to get my copy of FUNNY! : Twenty-Five Years of Laughter from the Pixar Story Room. This hardcover book is a nice collection of gags drawn by Pixar story artists for all of their feature films up through and including The Good Dinosaur. A few of the drawings are the original concepts that made it into the films, but most are not. Huge numbers of ideas are generated in the making of feature animated films, and the vast majority of them are tossed to make room for those that work the best. Still, many of the rejects are quite funny as well, and I find them all very interesting. 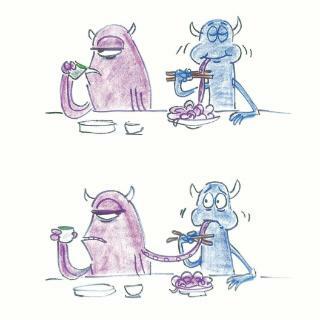 I particularly liked this unused gag by Matthew Luhn from Monsters Inc. It is a slightly twisted reminder of a famous scene from Lady and the Tramp. There is quite a range in the quality of the drawings. Some are pleasantly rendered, and others are crude doodles. What matters is whether it gets the idea across. One of the real insights in the book are the drawings that include content outside what is typically acceptable in a Disney-Pixar film. Meaning, not everything is “G” rated. Such ideas show they will push their boundaries. Imposing too much self censoring is not conducive to creative thinking. The secret to a great story gag has less to do with it’s novelty and more to do with the truth it possesses. The me, the funniest moments in The Incredibles are not the outrageous bits of spectacle, but the banal moments we recognize from our own lives. Ultimately, the book is more entertaining than educational. It is not a large coffee table book, and I went through in about an hour. If you are a big Pixar fan, or an aspiring story artist, I would say it is worth the reasonable price.